The Truth Commission process was focused on gathering first-hand, qualitative testimony about the experiences of New Yorkers in the Southern Tier, Capital Region and Long Island. Below is a collection of quantitative indicators on income, employment, housing, inequality, wealth, and incarceration in New York State, which help to put this testimony in a broader context. The federal poverty rate is often the statistic cited when policymakers, advocates and service providers talk about poverty and the poor. In 2017 the federal poverty rate is $12,060 a year for an individual and $24,600 for a family of 4. The testimony shared with the commission illustrates the inadequacy of the federal poverty rate in capturing the extent of poverty. While over 3 million New Yorkers fall below the federal poverty level, millions more live above that line and still face significant hardship. The United Way has developed another metric that shows the gap between the poverty line and self-sufficiency. The ALICE (Asset Limited Income Constrained Employed) Threshold is based on a "Household Survival Budget" - a conservative estimate of what it costs in a given region for housing, childcare, food, transportation, health care and taxes. In November 2016, the United Way of New York released a report on New York State, giving a comprehensive view of households who earn less than the cost of necessities in their area. The full report is available here. Lack of access to jobs with sufficient wages was a common theme in the testimony at all three events. Recent news reports have highlighted New York's falling unemployment rate, but many working New Yorkers are in jobs with wages that keep them in poverty or below the ALICE threshold. Women and Black and Latinx New Yorkers earn significantly less than white men. In addition, the unemployment rate is much higher among New Yorkers of color. In New York, 55% of jobs pay less than $20 per hour, with more than half of those paying between $10 and $15 per hour (ALICE Report, page 1). A living wage for a 1 adult, 1 child household in 2017 was $27.16 (New York State Annual Poverty Report). Lack of affordable, quality housing was another frequent issue raised in testimony. Several people had experienced periods of homelessness, and many others were living in overcrowded or substandard housing. Households paying more than 30 percent of their income on housing are considered burdened by housing costs. Close to half of households fall into this category in every major New York metropolitan area. Rent for a two-bedroom apartment is least expensive in Allegany, Chautauqua, and Chenango counties at $637 per month. Two-bedroom apartments in Nassau and Suffolk counties are most expensive, at $1,613 per month (ALICE Report, pg. 41). In New York State, poverty and hardship exist alongside great wealth. In both testimony and commissioner reflections, this contradiction was emphasized. New York has the highest income inequality in the nation, as measured by the Gini index. (Fiscal Policy Institute, 2018 Executive Budget Briefing, pg. 18). According to the Fiscal Policy Institute, almost half (48 percent) of increases in income in New York post-recession (2009-2015) went to the top 1 percent of earners (Fiscal Policy Institute, 2018 Executive Budget Briefing, pg. 18). As in the nation generally, inequality in New York is increasing. The top 1 percent's share of income grew from 12 percent in 1980 to 32.4% in 2015. 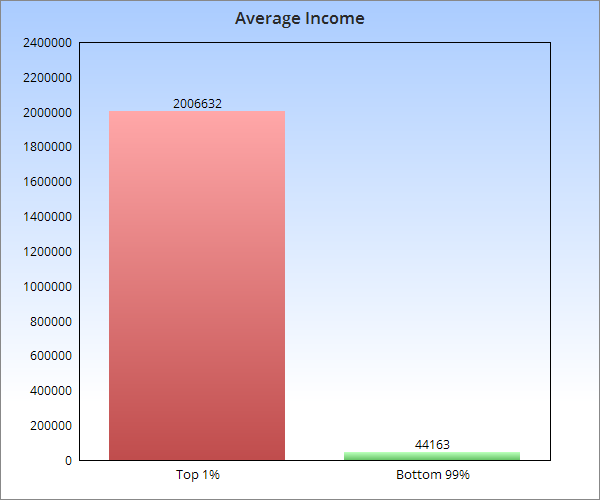 In 2013, the average income of the top 1% in New York State was $2,006,632 and the average income of the bottom 99% was $44,163. At each of the Truth Commission events, people shared stories of being unable to access needed healthcare or being at risk of losing needed healthcare. In 2014, the average health care cost in New York was $141 per month for a single adult and $564 per month for a family, not including health insurance, which represents an increase of 56 percent from 2007 to 2014. (ALICE Report, 2014). In 2016, 7.2 percent of New Yorkers age 18-64 had no health insurance (Centers for Disease Control). Underinsurance is difficult to measure and refers to individuals and families who, despite paying for health insurance, forego care due to out-of-pocket costs. In 2017, the least expensive Bronze family plan on the New York State of Health insurance exchange cost $12,563 annually with an $8000 deductible and 50% coinsurance after deductible for ambulance, urgent care, imaging & diagnostic tests, outpatient visits, and chemotherapy. In a 2016 New York Times and Kaiser Family Foundation poll, roughly 20 percent of people under age 65 with health insurance reported having problems paying their medical bills. Among those, 63 percent said they used up all or most of their savings; 42 percent took on an extra job or more work hours; 14 percent moved or took in roommates; and 11 percent turned to charity. A number of those testifying had been incarcerated or had family members incarcerated and shared about the difficulty of accessing housing, employment and education with a criminal record. New York's incarceration rate (260/100K) is 41st in the country, lower than the national rate of 458/100K. However, New York has the fourth highest disparity between Hispanic/White incarceration rates and the 12th highest disparity between Black/White incarceration rates in the nation. 26% of prisoners have spent six years or more under custody. 32% of prisoners have spent less than one year under custody. Almost 17% of prisoners have spent 10 or more years incarcerated. The median length of time of incarceration was 25 months. Additionally, advocates estimate the number of prisoners in ‘keeplock’, another form of solitary, to be approximately 1000. These numbers do not include county jails. Conservative estimates of use of solitary in county jails is approximately 1000.